How exciting!! 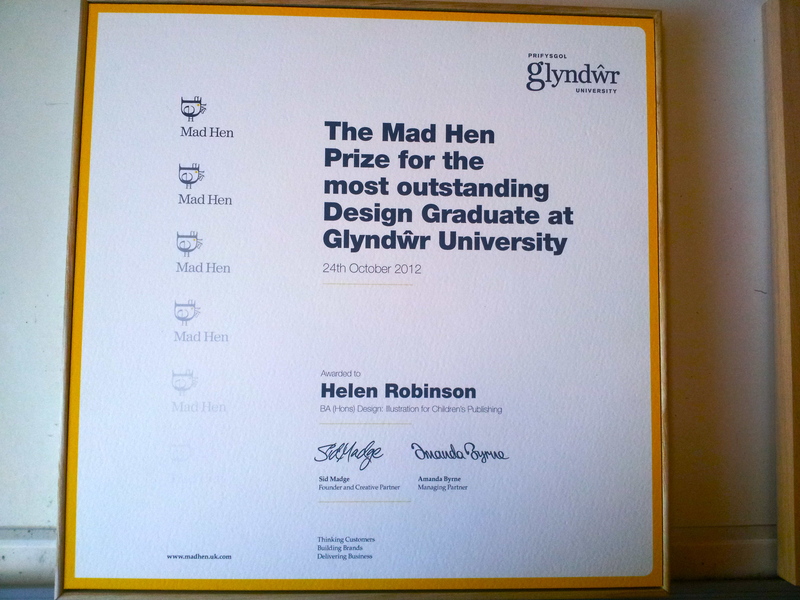 Yesterday was my long awaited graduation day, where i had been told i was also receiving an award ‘The Mad Hen Design Award’ for the most outstanding design graduate at Glyndwr University! 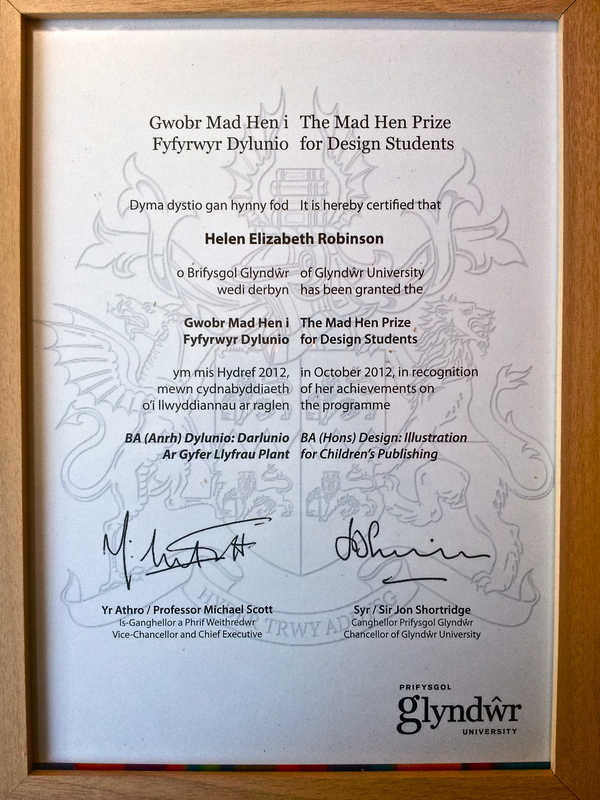 I was chosen for this award from all the Design Communication students in our year, Milena Polak won the award for Graphic Design and John Whitbred won it for animation. 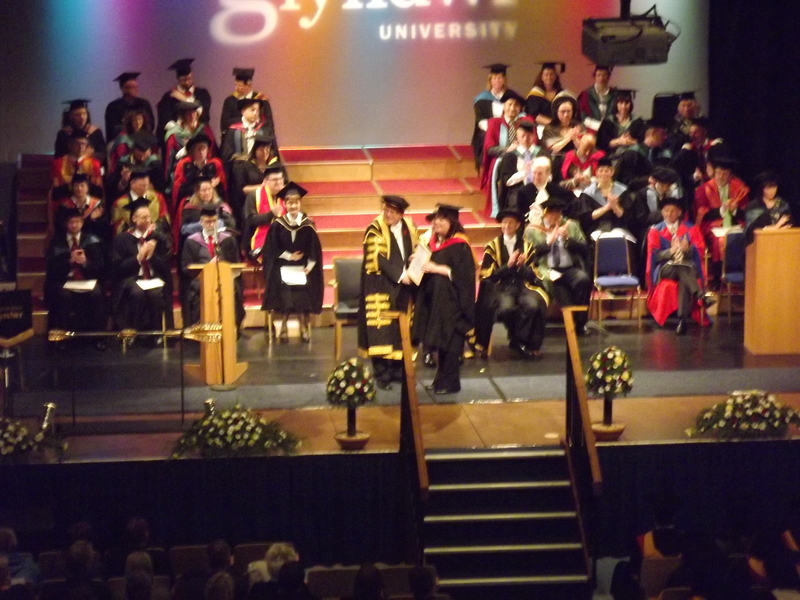 But seriously, it was an absolute honour and a privilege and i felt that all the hard work i had put into my work and also into helping others had been recognised throughout the 3 years, and it has really spurred me on to continue the standard throughout my MA ! 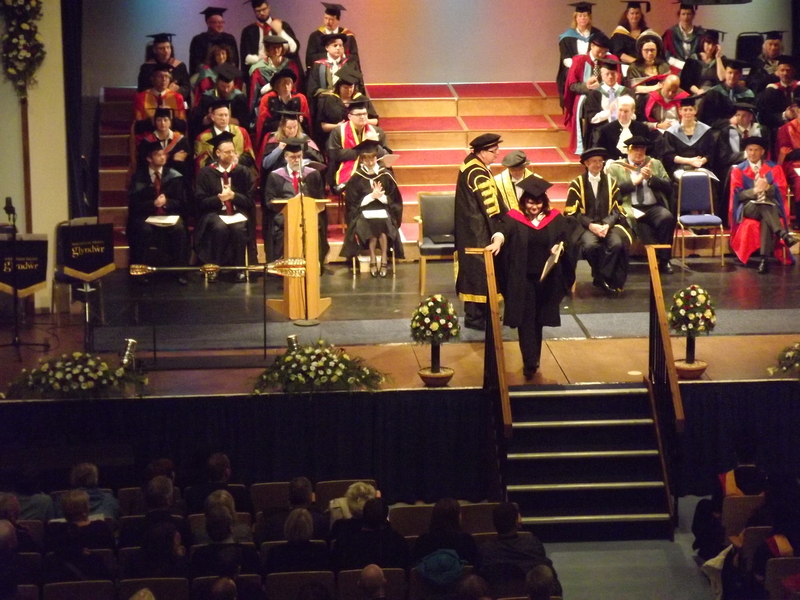 Shaking the hand of the vice chancellor when i received my award. 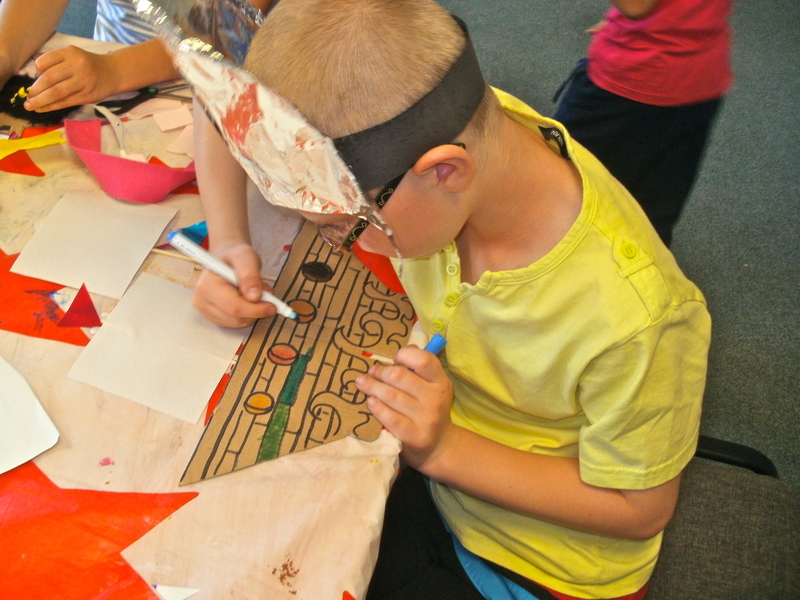 ‘Jaminosh Designs’ – cushions are now being created!! 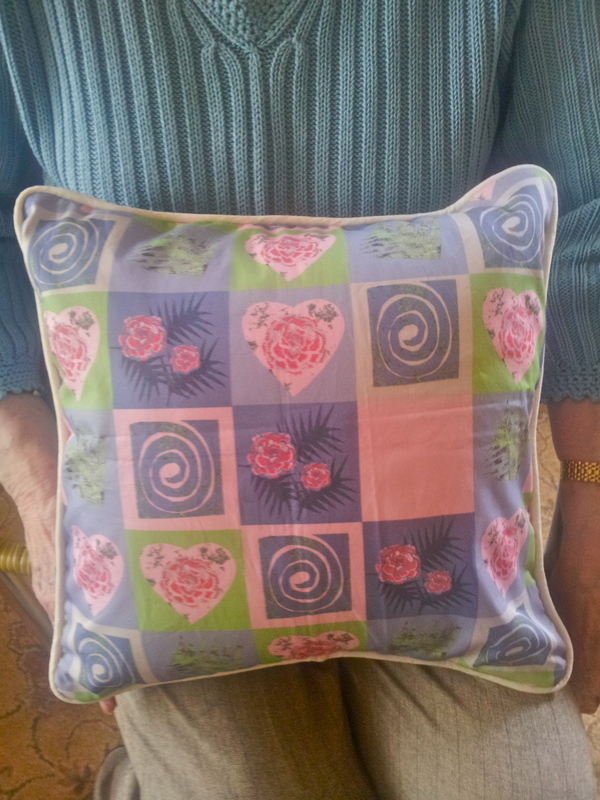 How exciting today when my lovely friend Jean set about making my cushion ‘prototypes’ out of the fabrics i have designed. This one is called ‘Hearts and Squares’ and was originally designed for children’s wallpaper, but all the while i was thinking that it would be better as fabric – and here we go…with a little cushion to show! 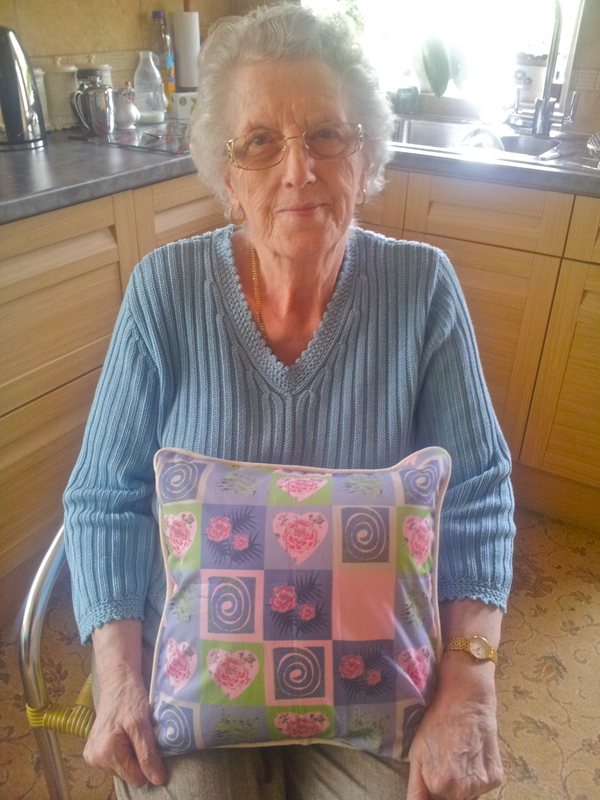 The first of many ‘Jaminosh Designs’ cushions – courtesy of the lovely Jean!! So i now know that if you are making a 14 x 14 cushion – with a flap, you would cut the fronts 15 x 15, and the back 22 x 15, which you would then cut into 2 pieces of 15×10 and 15 x 12!! 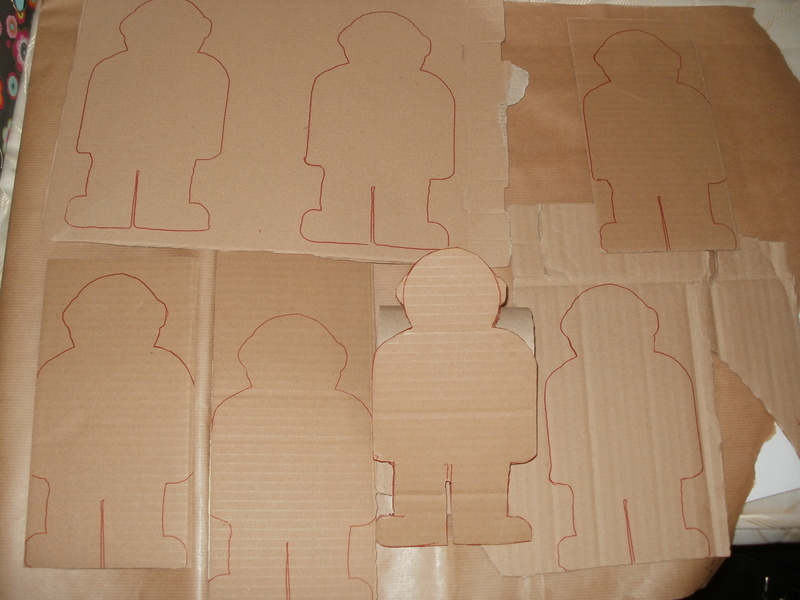 …hmmmm, it is all a big learning curve, next to learn how to put a zip in..then there will be no stopping me! :0) Sewing ‘should’ be in my blood, and i am sure it probably is somewhere as my grandma was a tailoress and seamstress and my grandad was a master tailor, so i am wondering what they must be thinking watching me doing this? Lets hope they will be urging me on! 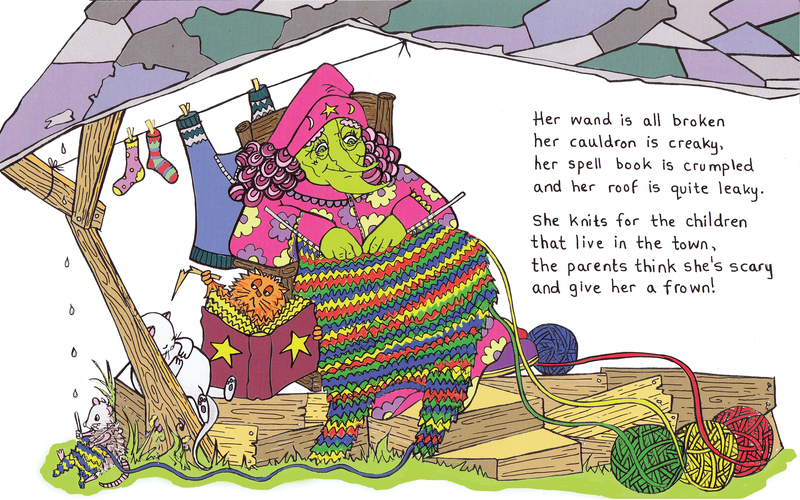 ‘Brenda – the misunderstood witch’ – a sample page for you to see!! I have just submitted my entry to the Macmillan Children’s book competition where i managed to get 8 double colour pages done, a book jacket, end papers and title and copyright, but still need to do 4 more doubles now to finish by sunday so i can send it off to Blurb to get a really professional mock book done for my final university assessment in a couple of weeks – so the pressure is still on for now!! The story is about a witch that is judged because she looks scary, and is green and hairy etc, and it gives you a surprising insight into her world, and details what she is really like.It is a book that aims to teach children to not ‘judge a book by its cover’ and to be more accepting of others (which i think is really important especially in this modern day world where the boundaries of race, creed and culture become merged). 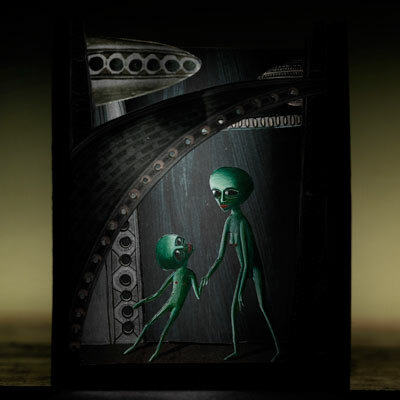 I think it is important that children’s books carry some sort of message, as children are really influenced by what they see and read, and i tried to make the main character as loveable as possible so that the children would be drawn to her. Well what a great day today, just as i was working on creating a 4 foot green witch for my graduate show, and was struggling to get the dimensions right, the doorbell rang and there was a Fed Ex guy at the door with a tiny little package…i was excited though as i knew this would be the first sample of my fabric design that i had sent off to ‘Spoonflower’, and i needed it to make things to show how i would use the fabric. 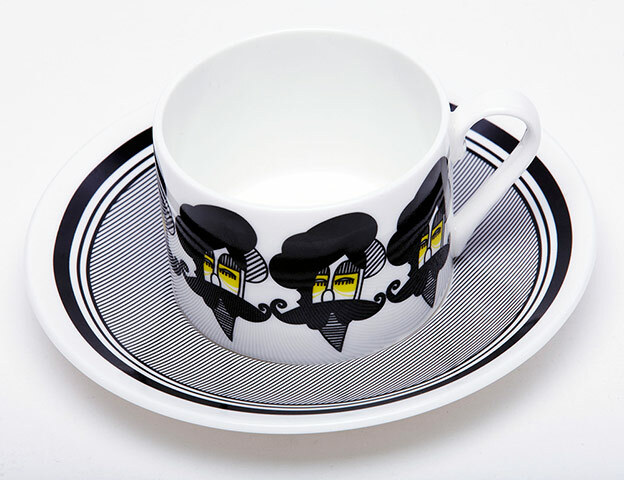 The design is called ‘Time for Tea’ and it is based on the ‘British afternoon tea’ which consists of bone china cups, silver tea pots, sugar cubes, cake, strawberries, coffee pots, and lovely old clocks. It is really designed as a kitchen design that could be used for T Towels (if anyone still uses them) aprons, serviettes, place mats etc, but then it would also look lovely on cake tins etc. I am working on a black and white version for kitchen wallpaper too. 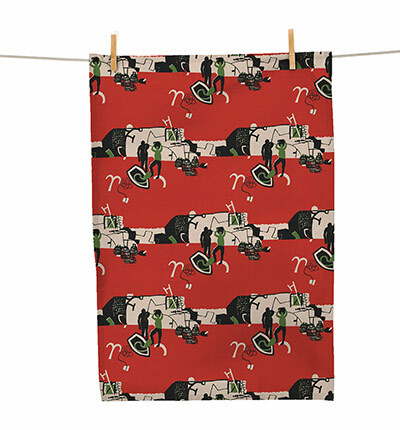 I like the ‘illustrated look’ for wallpaper and also fabrics, and have some others that i need to try and get done before the show, but time is running out, so i may need to save some of it for ‘New Designers’ show in london at the beginning of July this year. At the show i will be displaying the 2 books i have written – and also fabric and wallpaper designs, so please feel free to come along during that week to see. The trade and professional day is the wednesday 4th July, when i will be there along with my portfolio etc, the rest of the week is open to the general public. 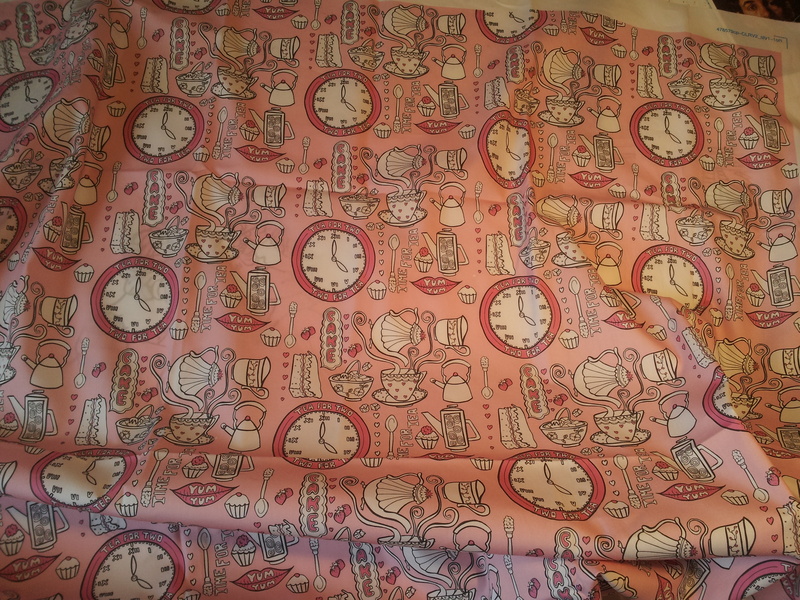 Here is the finished fabric – shame to cut into it don’t you think? 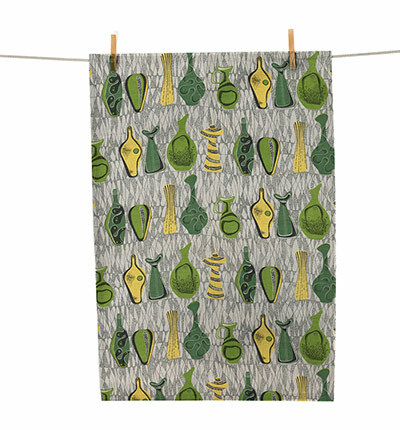 Looking at these Tea Towel designs that are on exhibition in the V and A in London (in their spring exhibition 2012) makes me realise how repeat pattern in design is everywhere – even on the bit of cloth we use to dry the pots!! However i don’t think that we will have seen many designs as intricate and as impressive as these for a long while – shame to get them wet really, there are a few i would have put on the wall as a work of art! 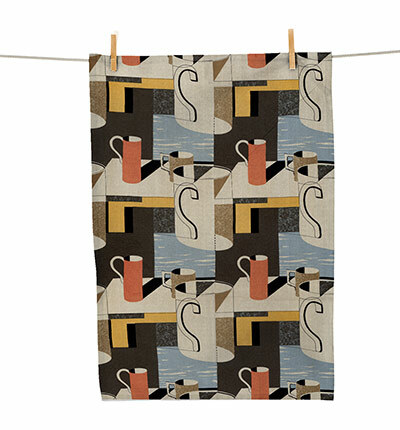 All of the images are from ‘Guardian.co,uk’ – with the link http://www.guardian.co.uk/lifeandstyle/gallery/2012/mar/20/british-textile-design-tea-towels#/?picture=387551198&index=0, and i will note the individual image numbers with each image. 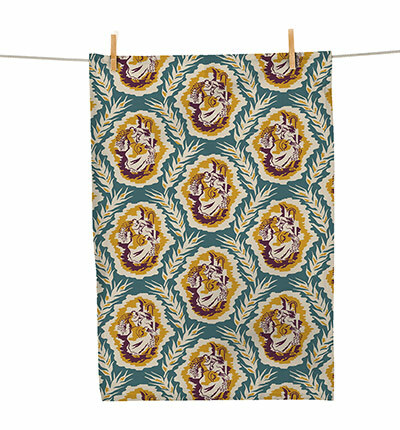 I really like the design on the T Towel above and i wonder if it is because the colours are so deliberately separate and bold? It reminds me of Picasso in his cubist period for some reason. 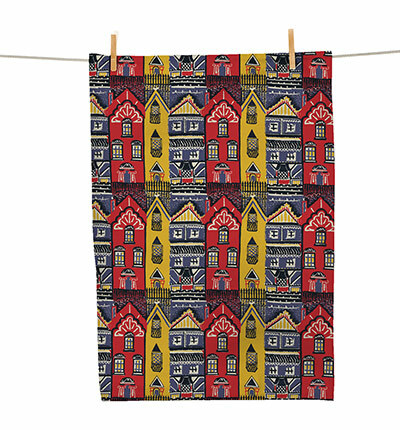 I think the last one is really my most favourite, i love the blue, yellow and red houses, and the clearly visible repeat. I find the imagery to be quite contemporary which is interesting as they are 1950’s designs, which then makes us beg the question of whether or not anything is every truly unique, as we surely use the past as a reference point at some point? I have never been an artist or designer that will copy others work, at first when i was training i was appalled to see people directly copying, and i would be determined to not look at any other influences, but i soon found that there were benefits to looking at people’s work but it depends on what you are looking at it for. I am never short of ideas, so i would never look at other artists work for ideas, but sometimes if i am working with a technique i will research artists that use a similar technique, and then this tends to open my mind to a wealth of opportunities, But i think that we are constantly influenced whether it is deliberate or not, from the TV, magazines, our environment etc – we can’t get away from it. 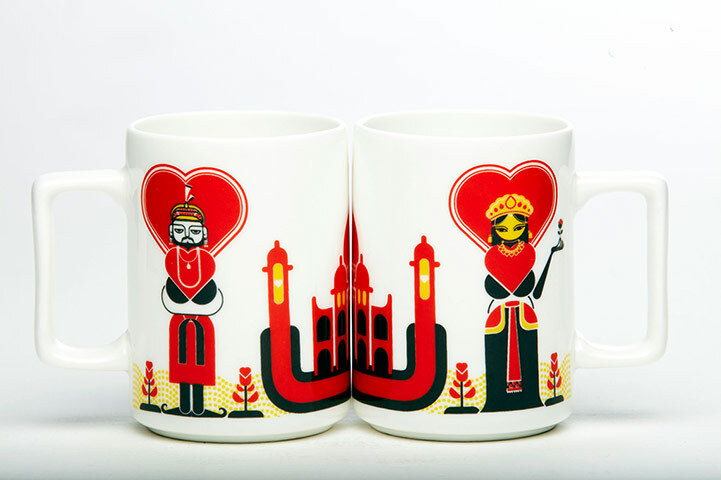 Because i am totally paranoid about copyright and the abuse of such, i will start by saying that i found these images on the ‘Guardian.co.uk’ website, under the heading of ‘India meets China: Homeware with an Asian twist’ – and was totally impressed with the bright and bold designs two of these companies ‘Play Clan’ and ‘Happily Unmarried’ (what a totally amazing name for a company – i am also happily unmarried/divorced, but don’t really feel the need to share that with the world – but if it makes them feel better then what the hell!!! Here are just a few of the images that i liked…. 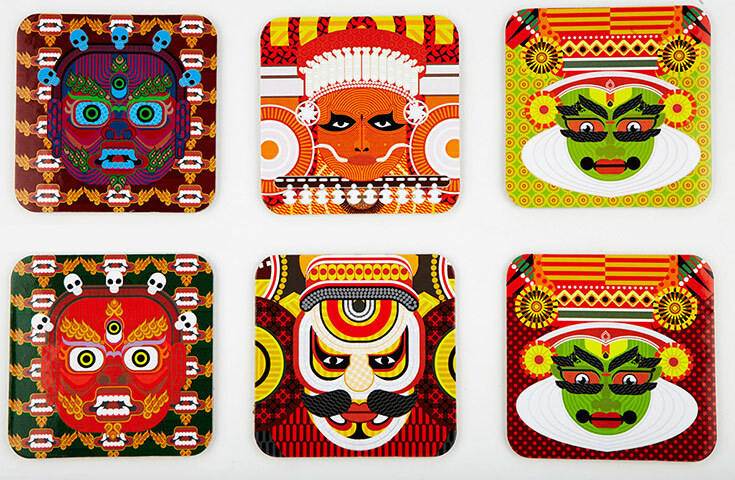 I am totally in love with the vibrant colours, strong lines and design. There is no attempt to soften and blend, but only to be bold….a bit similar to myself perhaps? :0) – maybe that is why i like it? 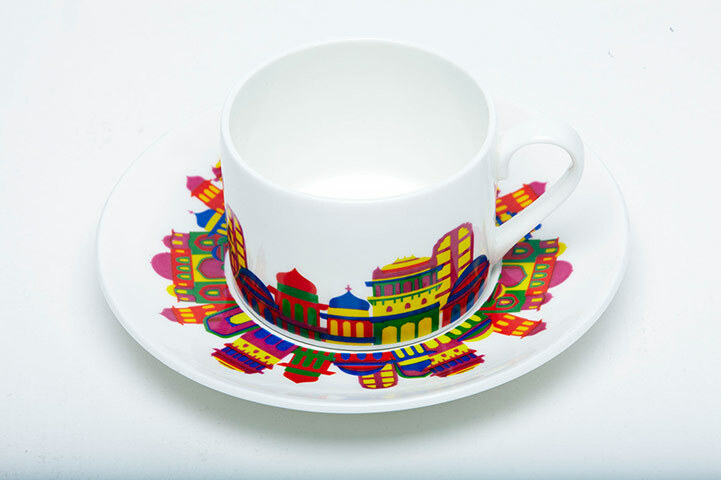 I have always been a great fan of Matisse and Hockney, loving their strong lines, and the fact they were seemingly fearless when it came to using colour – this i think can be seen in these designs also, although i know that they are also representing their culture as well, and that is a huge influence on the design. One day i would like to go to India, and also places like Peru, to look at the designs and colours in the local fabrics etc – and many other places where the use of colour is flamboyant and used without restraint!! 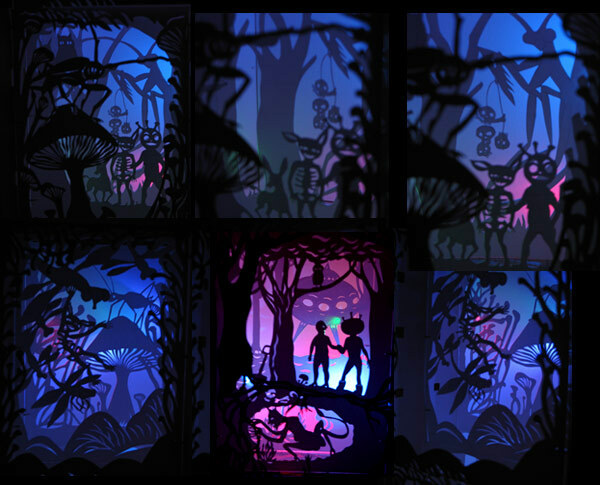 I have found quite a lot of people who use the multiplane technique for animation, but was struggling to find an artist that used it – let alone an illustrator! 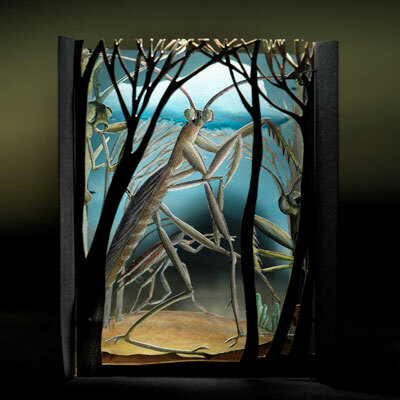 fortunately one of my tutors mentioned Clive Walley, and the fact that he was an artist who used this technique in his work – layering up the individual pieces of glass with paints. 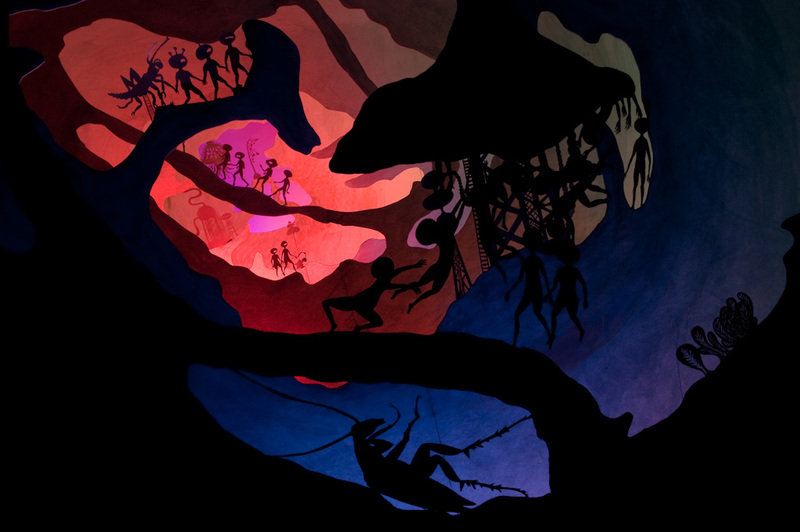 Today i have come across the work by an amazing artist Andrea Dezso. 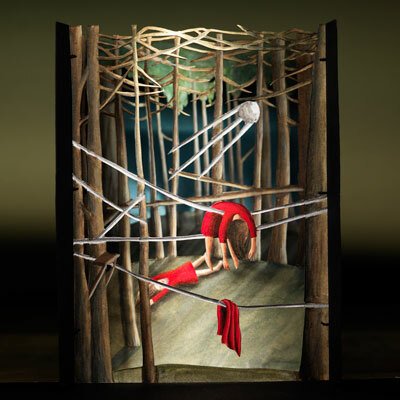 She describes her tunnel books as ‘drawings in space’, and creates amongst other things, contemporary styled tunnel books. 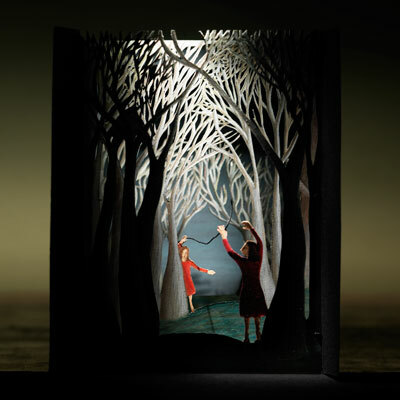 A tunnel book is a set of cut-out panels, set one behind the other, and attached together with accordion folded hinges so that the scene can be opened out for viewing or folded flat for storage.They were popular paper toys in the mid 1800’s when they were known as ‘peep shows’. 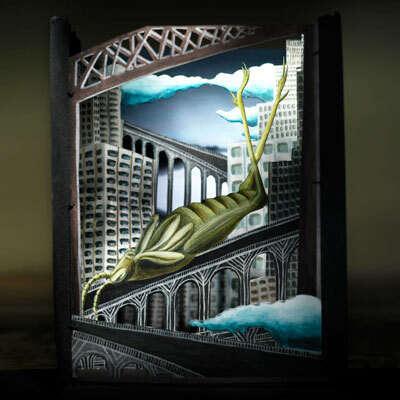 She also does lots of other types of creative work – animated embroidery, works in porcelain,public art pieces such as can be seen below, where an enormous tunnel type creation was commissioned by the Rice Gallery in Houston in 2010. I would so love to see some of these creations in real life as they are stunning digitally, i can only imagine how amazing they look in real life!! Commissioned large scale tunnel effect piece - called 'sometimes in my dreams i fly' - inspired by imaginary travel to the moon! So this session was to be the last one in a course of six sessions. 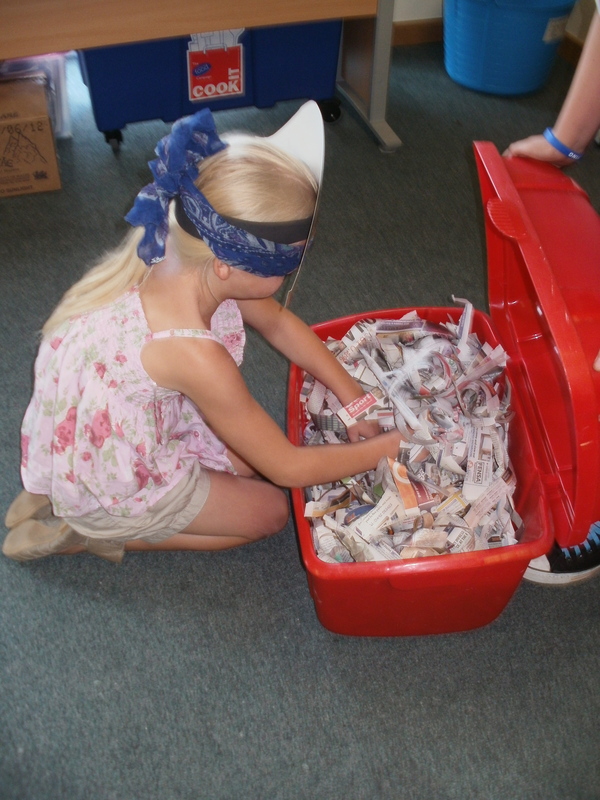 I had grown quite fond of the group of children that had attended every week without fail, bringing with them egg boxes and newspapers and lots of enthusiasm and creativity. They had been a joy to be with, and i learned so much about myself as an artist, a teacher, and also as a parent to my own children. 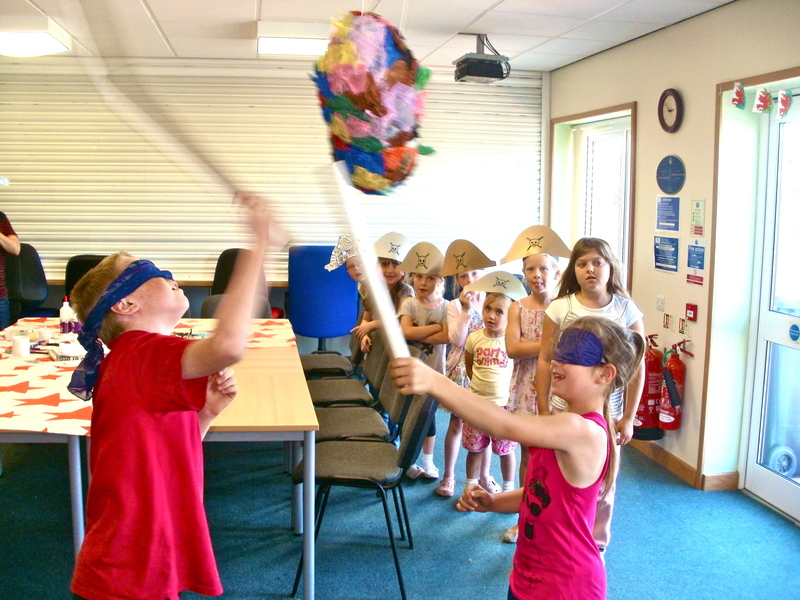 As we didnt have the balloon characters to work on any more i decided that the last session needed to have a ‘theme’, and i wanted to plan lots of activities within it so that it was lots of fun! 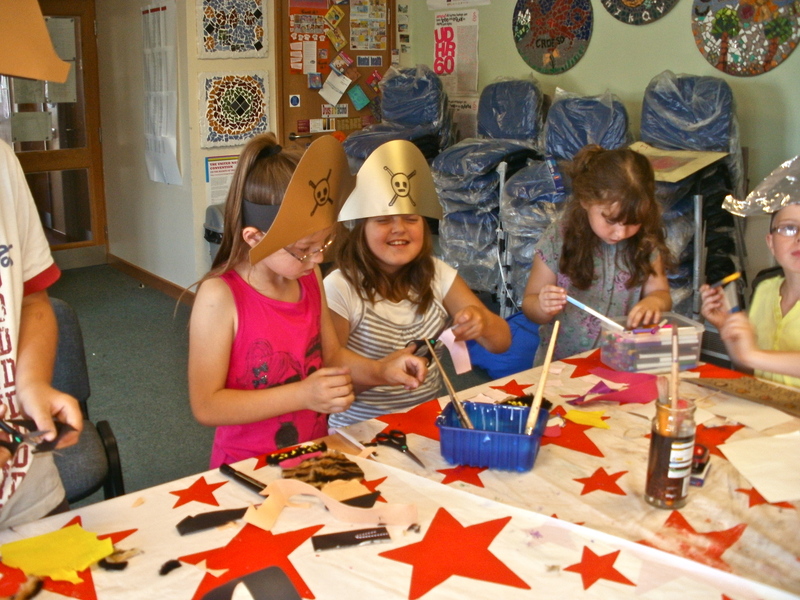 The theme i chose was that of PIRATES!! 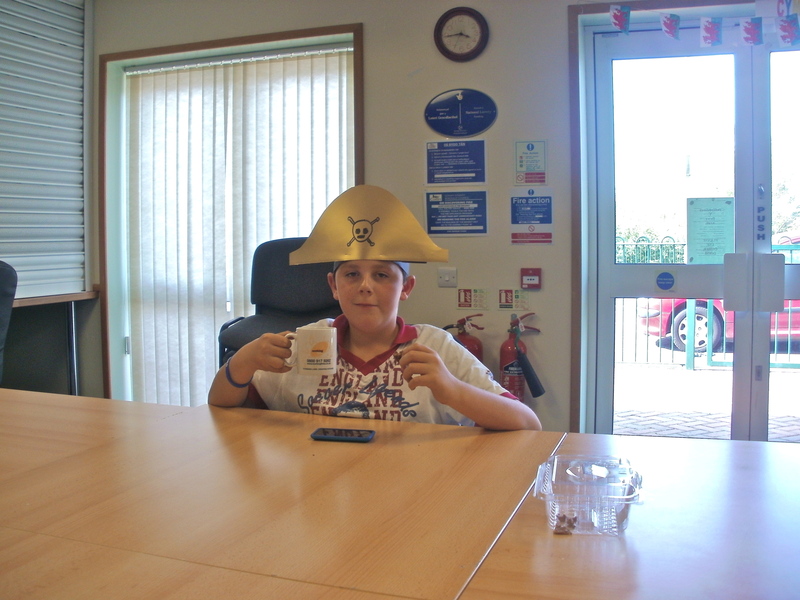 as i knew that most children love pirates! 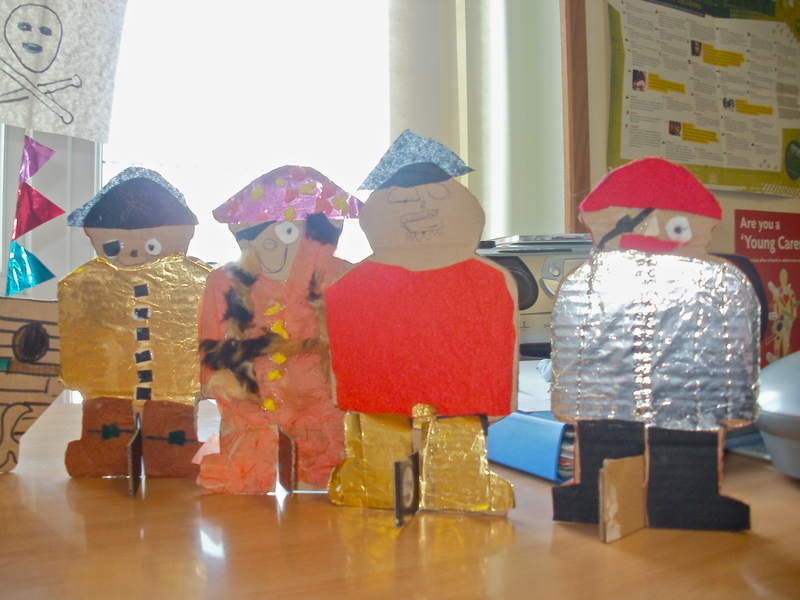 The first thing that we did was to talk about Pirates, and what sort of lives they had, what they ate, and where they lived and what they did etc – then i gave them a basic cardboard cut out of a pirate shape and asked them to use materials and felts etc to decorate them and to create different pirate characters out of it all. 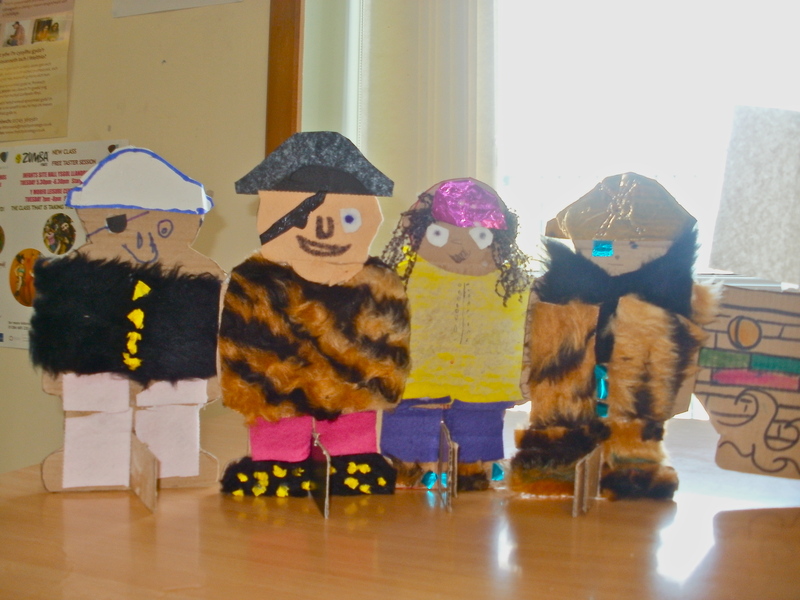 At first a couple of the children struggles a little with what the pirates should wear until i reminded them again that there wasn’t a right or a wrong as they were their characters, and they could create whatever they wanted. 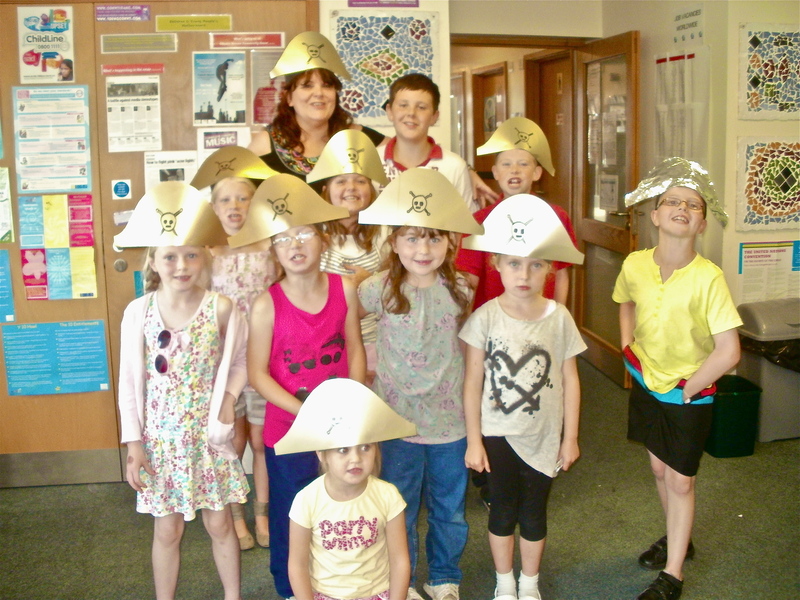 Pirate hats were compulsory today!! 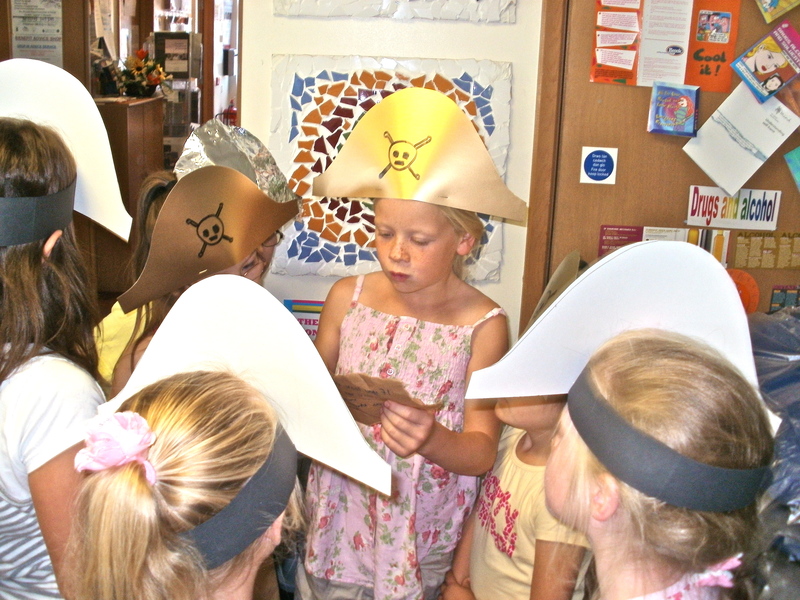 Of course pirates HAVE to go on a treasure hunt! 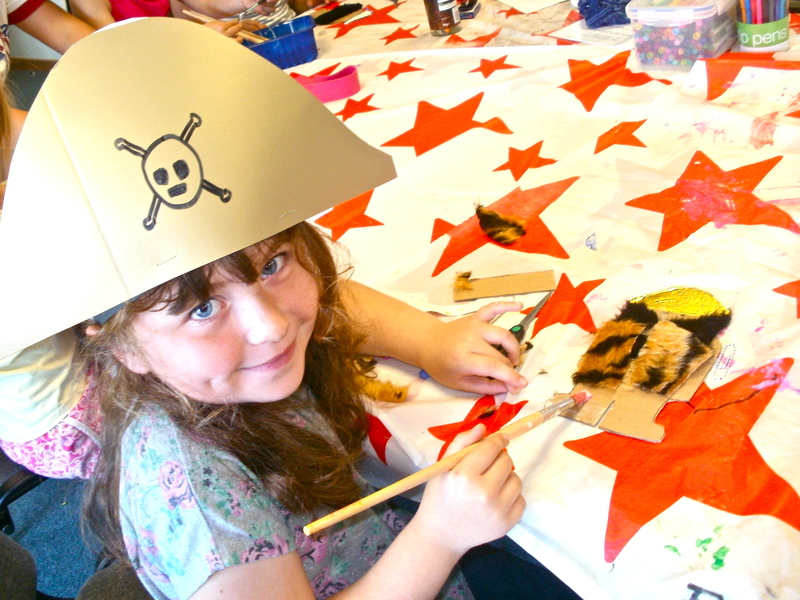 and make sure you get the treasure out of the Pinnate too!! and a good good time was had by all! !